Earlier today Honda Pro Racing unveiled that they have partnered with Red bull racing for the 2017 World Superbike season, revealing their new WSBK livery. 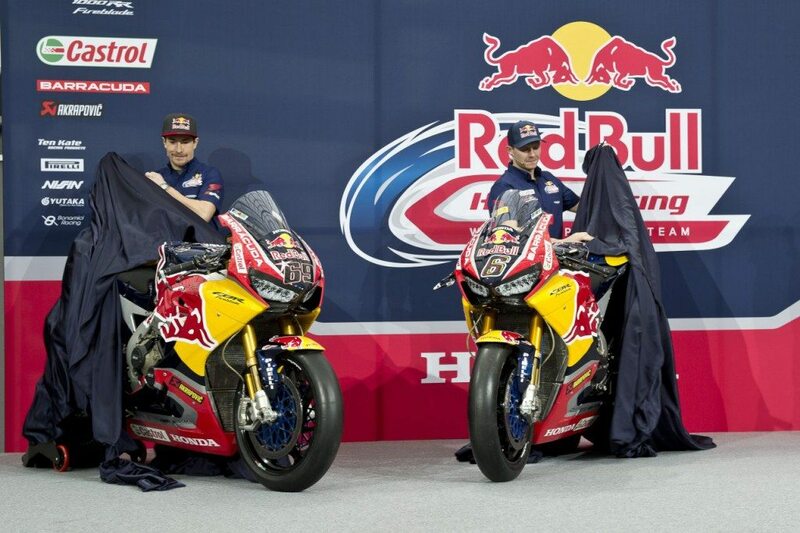 There has been much anticipation for the all new Honda CBR1000RR Fireblade SP2 that teammates Nicky Hayden and Stefan Bradl will be piloting this year. Hayden, a former Motogp world champion, moved to World Superbike for the 2016 season on board the Tenkate CBR1000RR managing a 5th place overall finish in the championship. Stefan Bradl, also a former Motogp stand out, will be contesting his first season in World Superbike. His last notable championship came during his 2011 Moto2 season. In 2016 we saw great strides from Hayden and former teammate Michael Vandermark, both of which were aboard the last gen Fireblade, a bike designed almost a decade ago and in need of some serious refinement. Even with an unfavorable hand both riders found good success, making the announcement of a new bike that much more exciting. Honda gave the all new fireblade more power while lowering the weight, netting a 14% increase in power to weight ratio. It also has a newly reworked electronics system, something that plays a factor in getting the most out of today’s superbikes. With a new bike and two of the most talented riders in the paddock Red bull Honda is looking to make a splash in 2017.